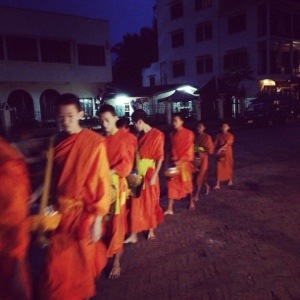 Today began at 530am as the local monks began their day with a walk through the dimly lit streets receiving offerings of rice from locals. After a bus ride south for a few hours there was just enough sunlight left to get lost in the caves and mountains in Vang Vieng. A new friend and I exploited the hidden caves and eventually were able to see the entire town from her peak and there, like Felix Baumgartner did earlier this year, looked down on land and had a moment where we reminded ourselves how truly small we are. Hiking down by moonlight and having nothing but the birds, full moon and stars as a guide were relaxing and yet hilarious. Relaxing because we were thousands of miles from the bright lights of LA but so close to the natural ones igniting the clear sky above. Funny because it was easy to recall memories as a child playing outside until the sun went down and all that was heard in northeastern Pennsylvania were the natural sounds….and yes, having your Mom yell that it was time for dinner was a natural sound for us….oh, the #SimpleJoys.